Northampton’s indie-popsters OhBoy! have been picked to play at next week’s Glastonbury Festival and will be playing a warm up show at the Garibaldi Hotel on Sunday. 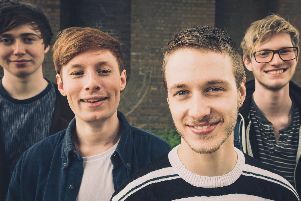 The alternative five piece, who released their new single A Bird In The Hand last week, will be playing on the BBC Introducing stage, after being put forward by the host of Northampton’s BBC Introducing show, Lal Muttock. OhBoy! comprises of singer and guitarists Jay Brook and Meg Amirghiasvand, guitarist Lee Irons, bassist Dan Battison and drummer Mark Nicholas. Meg said: “It’s very surreal. We got the email a few months ago so it’s been really hard to keep it under wraps. Earlier this year, they signed to Alcopop! Records and they recently played The Great Escape festival in Brighton and at Camden Rocks in London. Meg said: “BBC Introducing Northampton have been massive supporters of us, especially Lal. OhBoy! play the BBC Introducing stage at the Glastonbury Festival on the Saturday, at 3.55pm. Support at The Garibaldi Hotel is by Lucky Shivers and Future Love. Music is from 8pm.